Ozone (O3) is a reactive gas that exists in two layers of the atmosphere: the stratosphere (upper layer) and the troposphere (at ground level and up to 15km). In the stratosphere, ozone protects life on Earth from the sun’s ultraviolet radiation. In contrast, at lower levels, it is an important greenhouse gas and air pollutant, which is harmful to human and ecosystem health. 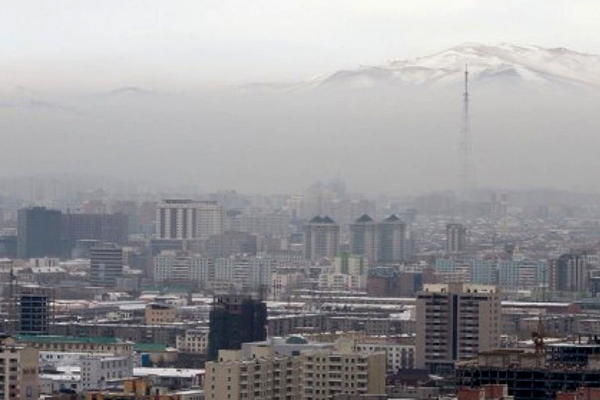 It is also a major component of urban smog. 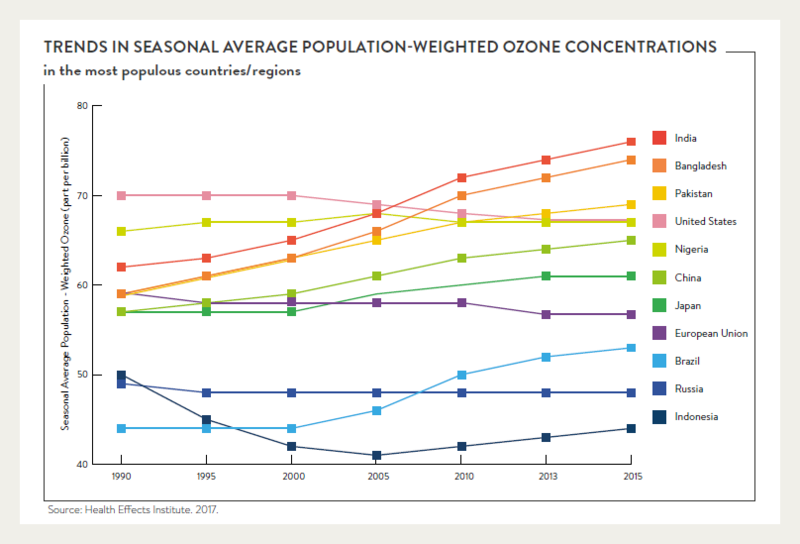 Tropospheric ozone is a short-lived climate pollutant with an atmospheric lifetime of hours to weeks. It does not have any direct emissions sources, rather it is a secondary gas formed by the interaction of sunlight with hydrocarbons – including methane – and nitrogen oxides, which are emitted by vehicles, fossil fuel power plants, and other man-made sources. Strategies to prevent the formation of tropospheric ozone are primarily based on methane reductions and cutting the levels of atmospheric pollution arising from man-made sources, such as agriculture and fossil fuel production and distribution. In the troposphere, ozone is the product of the atmospheric reaction of a number of precursor pollutants, which have both natural and man-made sources. Precursor pollutants created by human activities include hydrocarbons and nitrogen oxides, which are largely emitted by cars and other vehicles, fossil fuel power plants, oil refineries, the agriculture sector and a number of other industries. Ozone absorbs radiation and consequently acts as a strong greenhouse gas. Tropospheric ozone affects the climate beyond increased warming, having impacts on evaporation rates, cloud formation, precipitation levels, and atmospheric circulation. These impacts mainly occur within the regions where tropospheric ozone precursors are emitted, and so disproportionally affect the Northern Hemisphere. Tropospheric ozone is a major component of smog, which can worsen bronchitis and emphysema, trigger asthma, and permanently damage lung tissue. 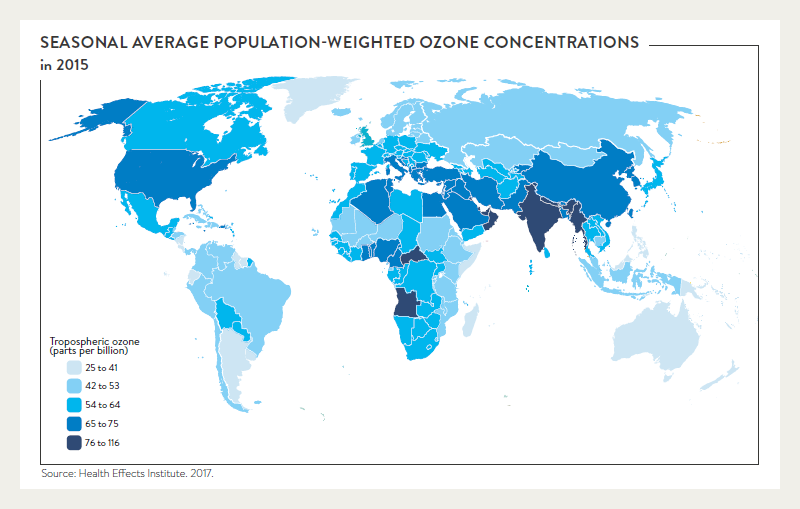 Tropospheric ozone exposure is responsible for an estimated one million premature deaths each year. Children, the elderly, and people with lung or cardiovascular diseases are particularly at risk of the adverse health impacts of ozone. Tropospheric ozone is a highly reactive oxidant that significantly reduces crop productivity as well as the uptake of atmospheric carbon by vegetation. Its effects on plants include impeded growth and seed production, reduced functional leaf area and accelerated ageing. Studies have shown that many species of plants are sensitive to ozone, including agricultural crops, grassland species and tree species. These effects impact on the important ecosystem services provided by plants, including food security, carbon sequestration, timber production, and protection against soil erosion, avalanches and flooding. Strategies to prevent the formation of tropospheric ozone are primarily based on methane reductions. Summary of the Climate and Clean Air Coalition governance structure, its workstreams, trust fund allocations, and achievements across sectors.